Must have been magical there...it was stunning here as we headed home early in the moonrise. Wow, that's an extremely lovely photo!! And more proof that Fort Benton is one of the prettiest settings in Montana. Montana sure can showcase a moon, can't she? We were out moving cows and on our way in, the sky was dancing with colors and shapes that I haven't seen for a long time, with that old moon presiding. This picture is just stunning. It's hard to catch the light that time of day. Yep, we can indeed! 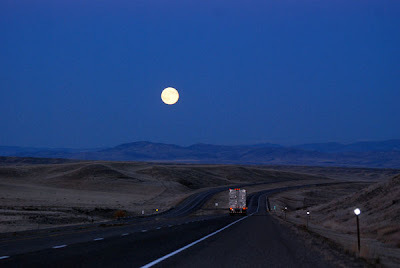 And there's something especially wonderful about an eastern Montana moon, where the skies are all the bigger. And I'm glad you like the photo. It was a lucky shot, mostly ... I just stopped the car, set the camera on the roof, and did a time exposure.